Grand Central (Decks 6-8, mid-ship) – A spin on the traditional atrium, here you will find day and night entertainment, delicious food at Bonsai, or a song along at Piano Bar 88. And, for the first time on Carnival, Punchliner Comedy Club will have its own venue where there will be nightly shows. French Quarter (Deck 6, aft) – Treat your ears to the smooth sounds of New Orleans jazz in the French Quarter. New to Carnival, this tribute to the Big Easy will feature all the Cajun and Creole fare you can fit into one vacation without spending your week on Bourbon Street. La Piazza (Deck 8, mid-ship) – Paying respect to Italy, here, guests can delve into the heritage of Carnival’s senior officers. Food from Carnival classics Cucina and Pizzeria del Capitano, to the brand new Mediterranean seafood joint, will make sure you stay full as you end your night being entertained by roaming musicians. Summer Landing (Deck 8, aft) – Kick back and chill out on Deck 8 at Summer Landing. Partnered with Guy Fieri, guests can enjoy classic barbecue from Guys Pig & Anchor, craft beers from ParchedPig, and relaxing lounge chairs by the pool. Lido (Deck 16-17, aft) – Back and better than ever is the Lido Deck on Carnival’s Mardi Gras. By popular demand, guests can dine at Guy’s Burger Joint, Seafood Shack, or Blue Iguana while lounging on the Lido Deck. Those that are more adventurous will have the opportunity to try the new, “foodie-inspired,” eateries Carnival has yet to announce. The Ultimate Playground (Decks 18-20, aft) – Highlighted by the first ever roller coaster at sea, BOLT: Ultimate Sea Coaster, this will be the ultimate family play area at sea. Guests will enjoy Carnival’s signature WaterWorks aquapark, an expanded SportSquare, and other exciting new features at The Ultimate Playground. 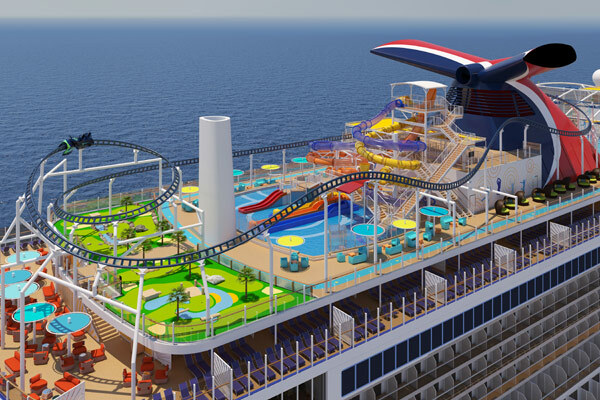 As we near 2020, Carnival will be announcing new details for this innovative ship. To be the first to know about these exciting amenities, as well as for information on Carnival Cruise Line and Mardi Gras, please call 1-800-377-9383 today to speak with one of our expert cruise consultants. We certainly loved the first Mardi Gras, one of Carnival’s first ships back in the 80s and a fine example of the old days of classic “transatlantic cruising”. It was very intimate and classy, but no less fun than the big ones today. Loved all that brass and back then everythi9ng was so much easier- before all the security issues of the 1990s. Mardi Gras was our first cruise to Jamaica, Cozumel and the Caymans. We were so young and pretty then : ) That was 33 cruises ago, most of them on Carnival. We’d love to help you find a cruise that matches that “classic” cruising style for which you’re pining. Give your consultant, James Mackey, a call today at 1-800-377-9383 x 396 to start planning! You can also reach James directly at jamesm@cruiseweb.com. Thanks for your comment. It seems like you are quite the seasoned cruiser! We are located near Baltimore, so we know Carnival Pride well! It looks like you used to work with one of our agents, Heather Wasson! If you’d like, I can reach out to Heather and we can get you on the new Mardi Gras!